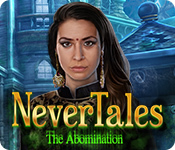 June 8th, 2017 by Chrysanne Westin in Walkthroughs. 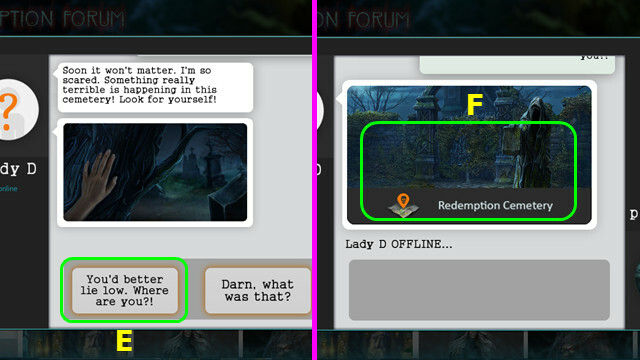 This document contains a complete Redemption Cemetery: Embodiment of Evil game walkthrough featuring annotated screenshots from actual gameplay! 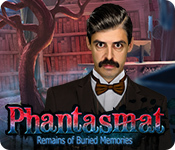 This is the official guide for Redemption Cemetery: Embodiment of Evil. 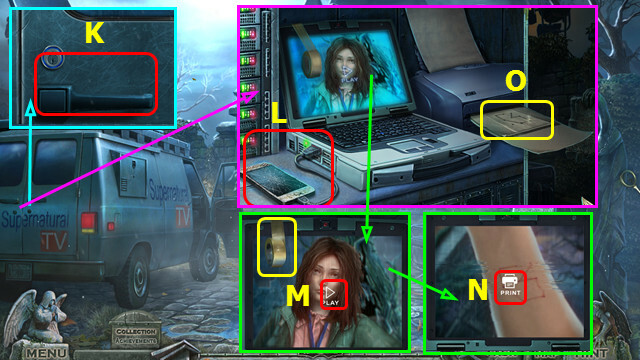 This guide will not mention each time you must zoom into a location; the screenshots will show each zoom scene. 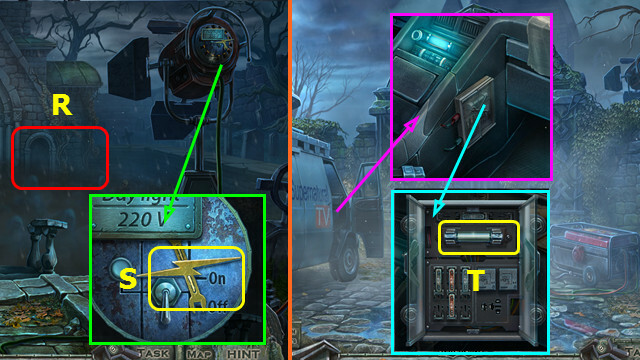 Take the GENERATOR PLUG (J). Take the ANGEL HANDLE; take and read the diary (L). Take the 1/2 HEART EMBLEM (M). 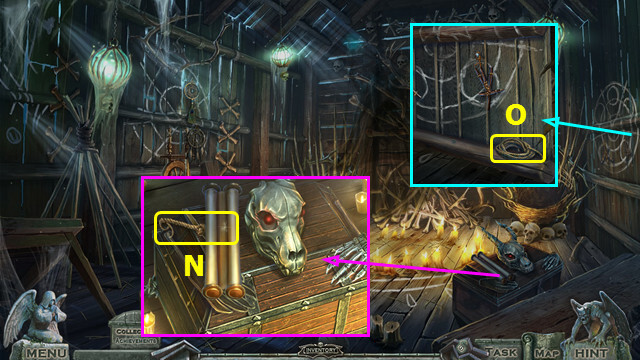 Take the SKULL MEDALLION (N). Take the 1/2 GOAT HEAD SYMBOL (O). 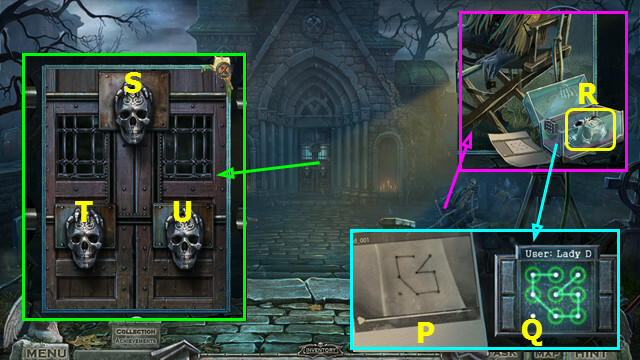 Place the SKULL MEDALLION; earn the DEMON HANDLE (P). 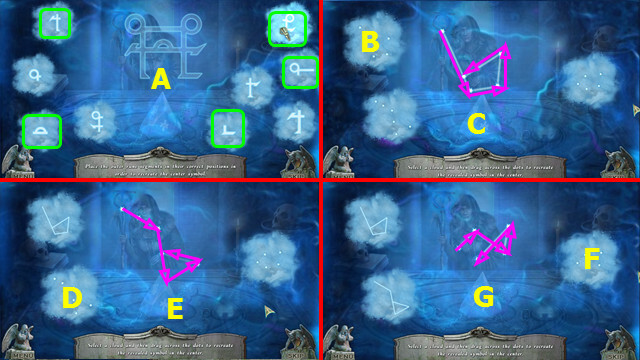 Place the ANGEL HANDLE and DEMON HANDLE; select (Q). Take the GLOVE BOX EMBLEM (S). 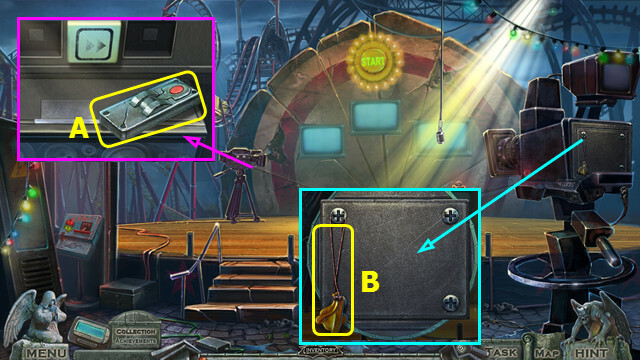 Place the GLOVE BOX EMBLEM; select 2x and take the ELECTRICAL FUSE (T). Open the fuse box, take the burnt-out fuse, and place the ELECTRICAL FUSE (A). 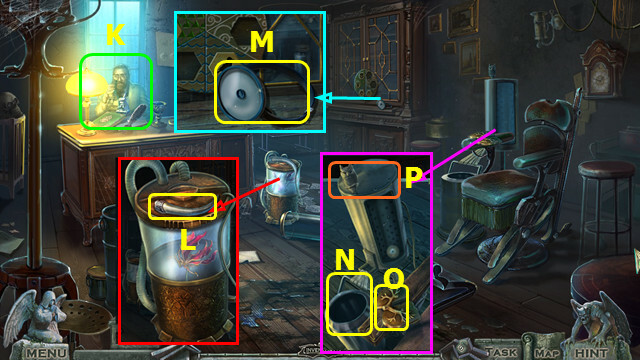 Place and select the GENERATOR PLUG (D). Take the USB PLUG (G). Take the BROKEN PHONE (H). Take the CAR KEY (I). Take the SKULL HAMMER (J). Use the CAR KEY; select the handle (K). 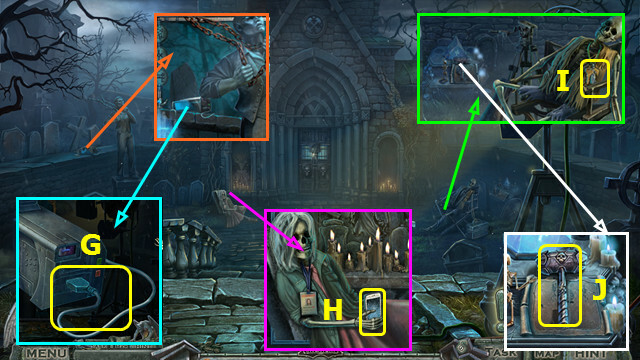 Take the 1/2 MYSTICAL RUNE and place the USB PLUG; add the BROKEN PHONE (L). Take the ELECTRICAL TAPE; select play (M). Take the STRANGE CODE (O). 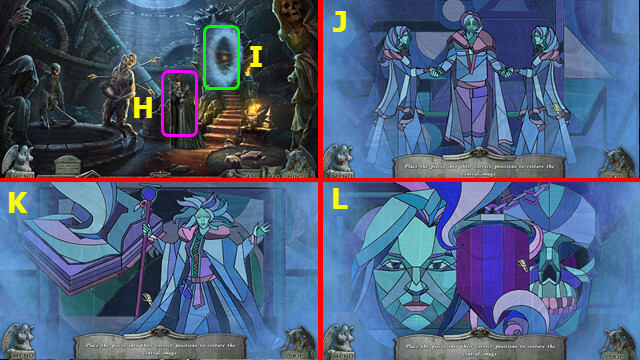 Place the STRANGE CODE (P). Move T right, U left, and T left. Take the 2/2 GOAT HEAD SYMBOL (A). Place the 2 GOAT HEAD SYMBOLS (B). 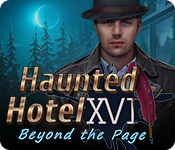 Play the HOP; earn the LIGHT OF SOULS (C). Use the LIGHT OF SOULS (D). Talk to Astrid; give the LIGHT OF SOULS (E). Take the 1/2 SKELETON FIGURINE (M). 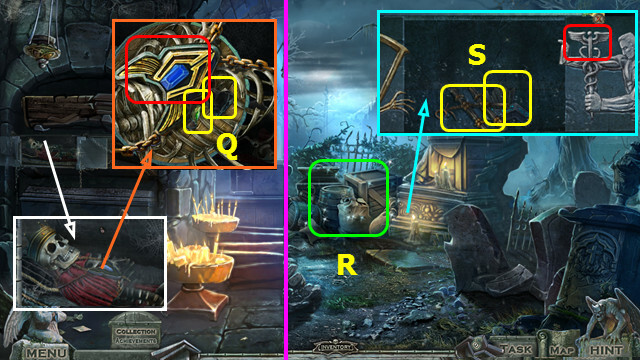 Take the 2/2 HEART EMBLEM; use the SKULL HAMMER and take the 2/2 SKELETON FIGURINE (N). 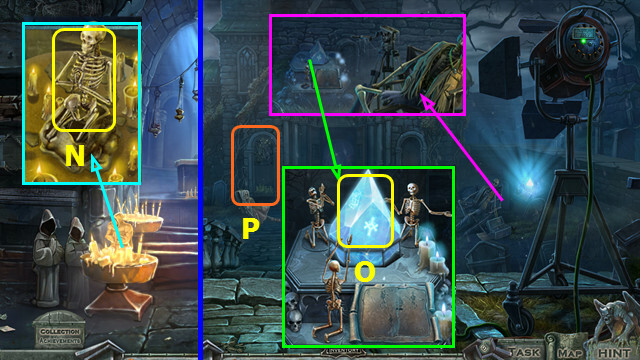 Place the 2 SKELETON FIGURINES; adjust the positions of the 3 skeletons as shown and take the SOUL CRYSTAL (O). 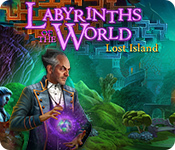 Play the HOP; earn the 2/2 MYSTICAL RUNE (P). 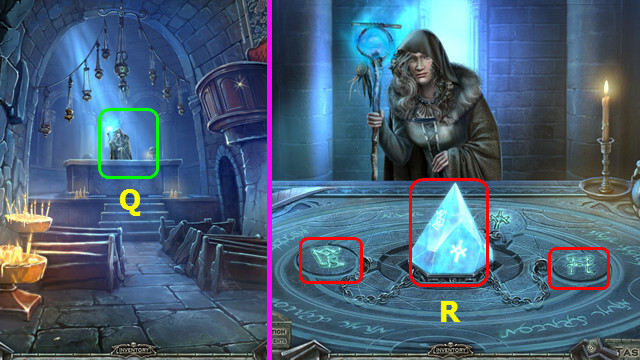 Place the SOUL CRYSTAL and the 2 MYSTICAL RUNES (R). Use the 5 pieces (green) to assemble the symbol (A). Select (B); recreate the symbol (C). Select (D); recreate the symbol (E). Select (F); recreate the symbol (G). Note: the clouds will move after each pair. 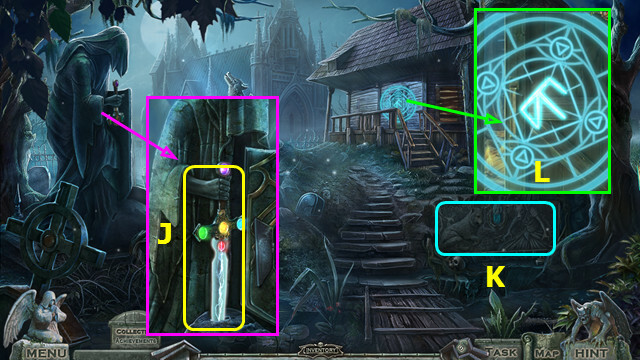 Take the GLOWING ARTIFACT (I). 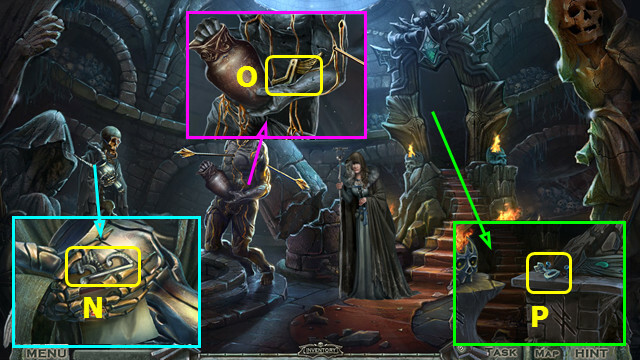 Place the GLOWING ARTIFACT (J). Talk to Felix; take KIRSTEN’S LETTER (K). Remove the cover; take the DRAWER HANDLE (B). Take the 1/5 TICKETS (C). 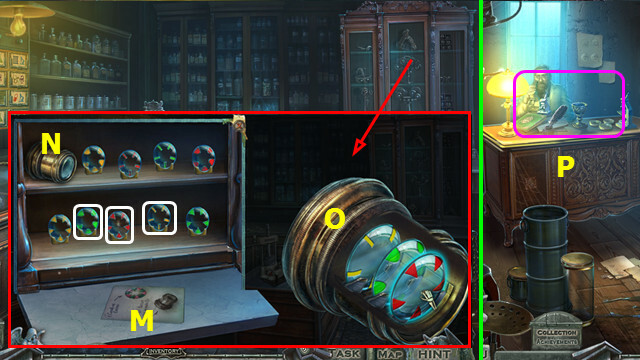 Place and select the DRAWER HANDLE; take the 2/5 TICKETS and push the drawer back in (D). Take the BAG; look through the hole (E). 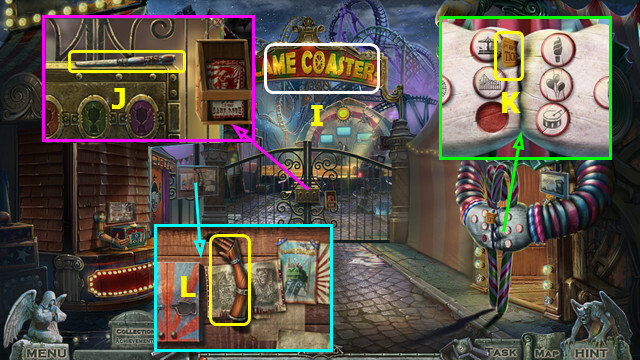 Place and select the 2 HEART EMBLEMS on the BAG; take the 4 LETTER PARTS, the MAGNET, and the 3/5 and 4/5 TICKETS. Combine KIRSTEN’S LETTER, 4 LETTER PARTS, and ELECTRICAL TAPE to make the CLOWN CLUE. 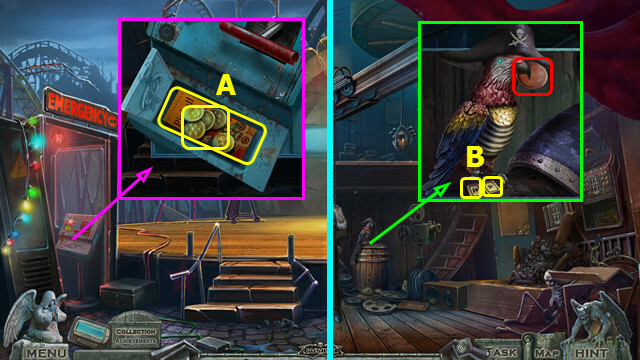 Use the MAGNET (F); select the drawer and take the 2 ENTRANCE COINS (G). 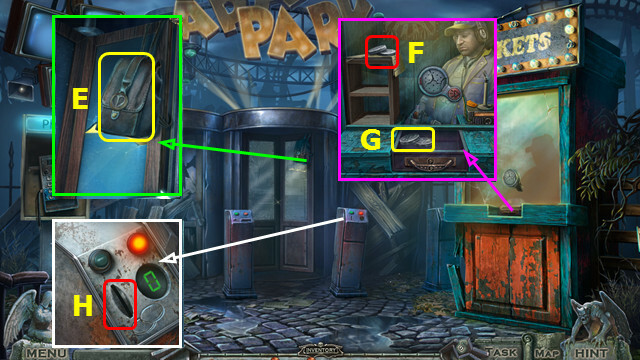 Use the 2 ENTRANCE COINS (H). Take the LETTER OPENER; read the brochure (J). Use the LETTER OPENER on the HANDSET; take the MICROPHONE. Take the 5/5 TICKETS (K). Take the WOODEN ARM (L). Take the 1/2 GAME COIN and STEERING WHEEL (M). 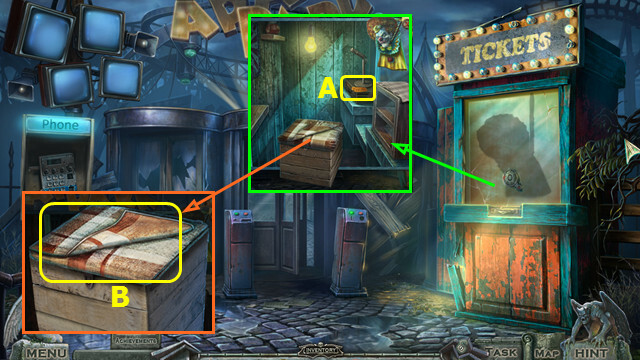 Place the WOODEN ARM and 5 TICKETS (N). 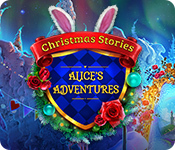 Play the HOP; earn the GIFT BOX (O). Use the LETTER OPENER on the GIFT BOX; open it and take the HORN. Remove the cover and place the MICROPHONE (P). 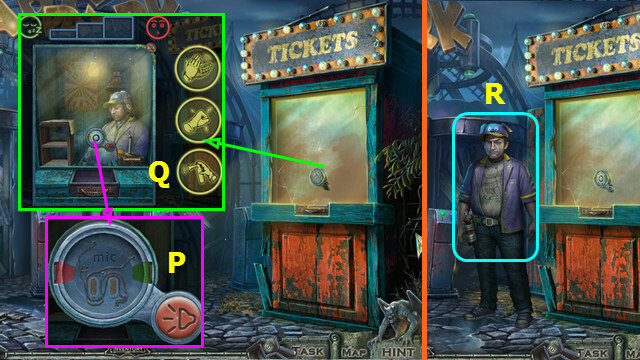 Talk to the Ticket Taker; take the CLOWN BUTTON (R). Take the 1/7 and 2/7 TICKETS (A). 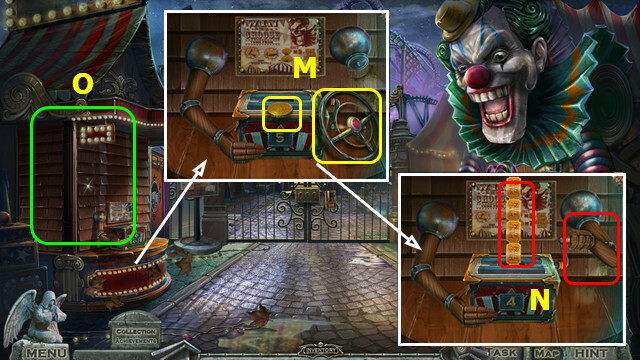 Place the CLOWN CLUE (E) and CLOWN BUTTON (F). 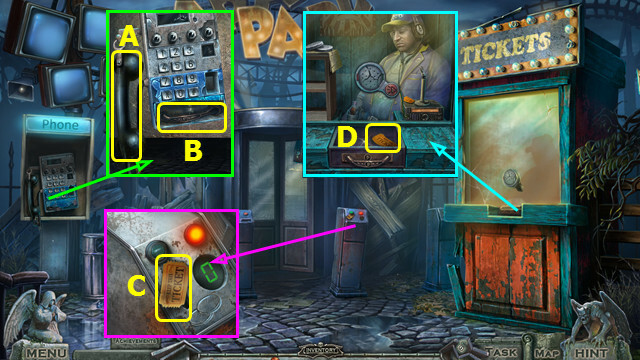 Arrange the buttons as shown (G). 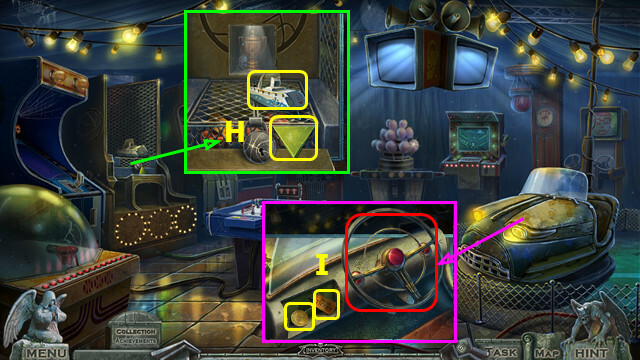 Take the TOY SHIP and ARROW BUTTON (H). 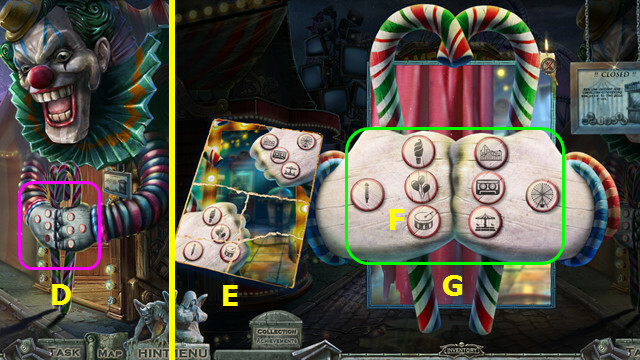 Place and select the STEERING WHEEL; take the 2/2 GAME COIN and 3/7 TICKETS (I). 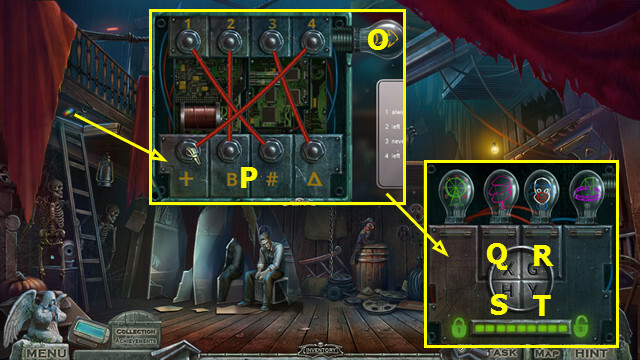 Place the ARROW BUTTON; use the buttons to collect 9 skulls (J). Take the 1/3 TROPHY (K). 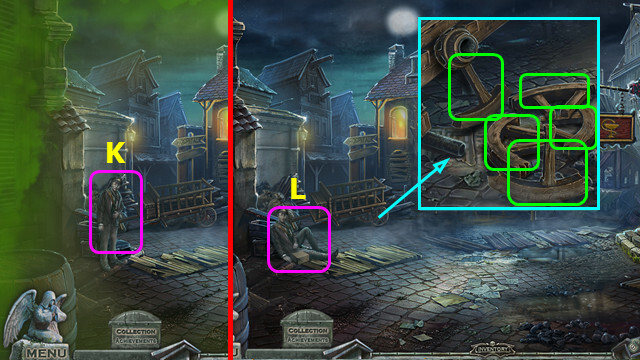 Place the 2 GAME COINS (L). Select M-N; take the TOY HORSE (O). 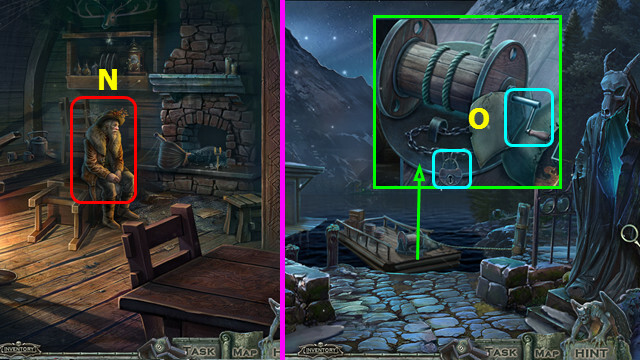 Arrange the pieces as shown; place TOY HORSE and select 2x (P). 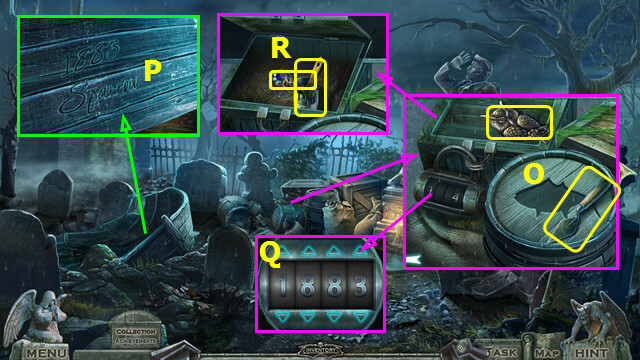 Select the little box (Q). 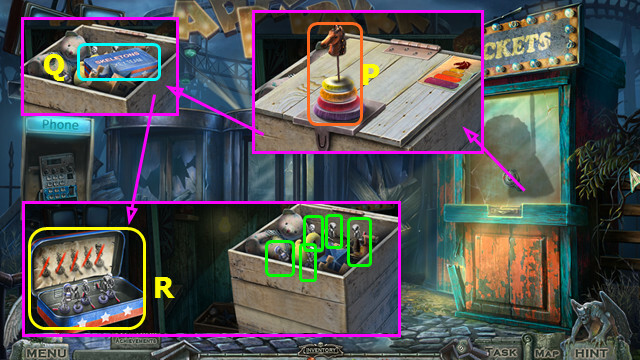 Open the little box (R). 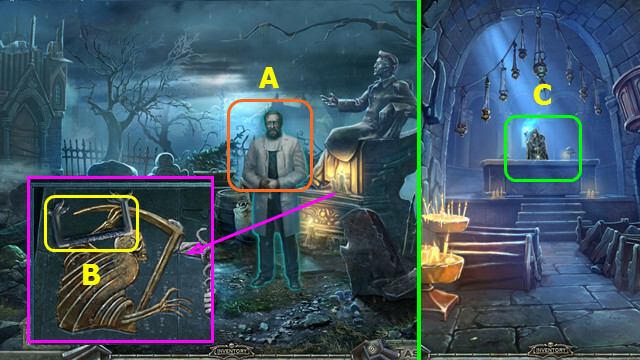 Move the items and select the 5 skeletons (green). Take the UNDEAD HOCKEY TEAM (R). 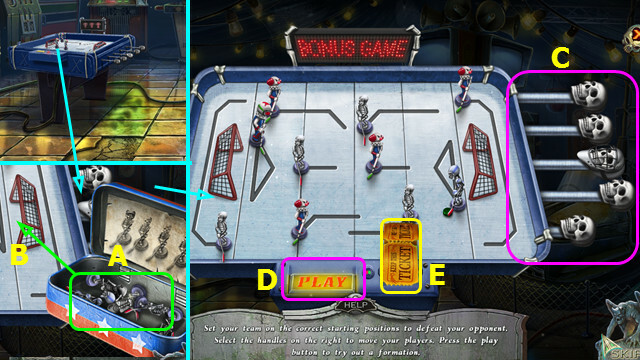 Place the UNDEAD HOCKEY TEAM (A); move them to the rink (B). 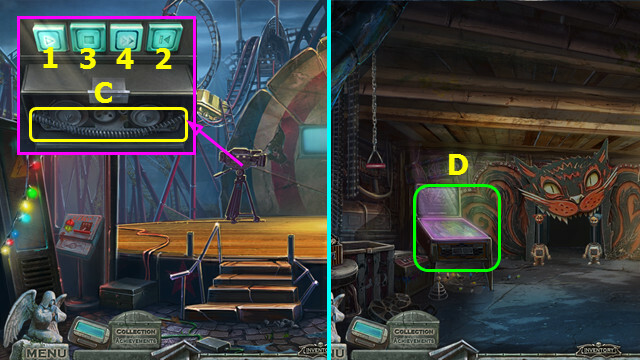 Move the levers to set up your team (C); select (D). This is randomly generated; your solution may differ. 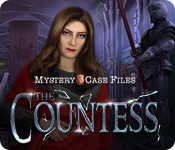 Take the 4/7, 5/7, and 6/7 TICKETS (E). 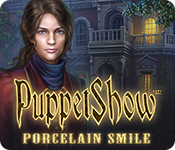 Play a second game; take the POINTER and 2/3 TROPHY. Place the POINTER; take the BASKETBALL KEY (I). 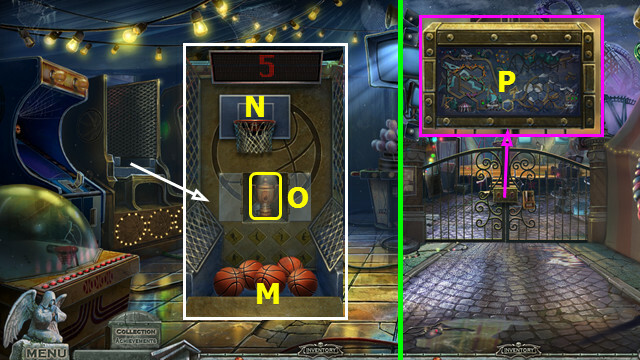 Use the BASKETBALL KEY; open the grate and take the 7/7 TICKETS (J). 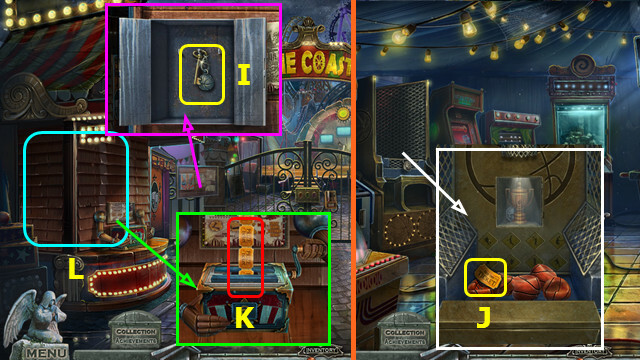 Place the 7 TICKETS (K). 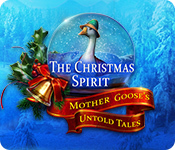 Play the HOP; earn the GIFT BOX (L). Use the LETTER OPENER on the GIFT BOX; open it and take the PUMP. Place 5 basketballs in the hoop (N). Take the 3/3 TROPHY (O). 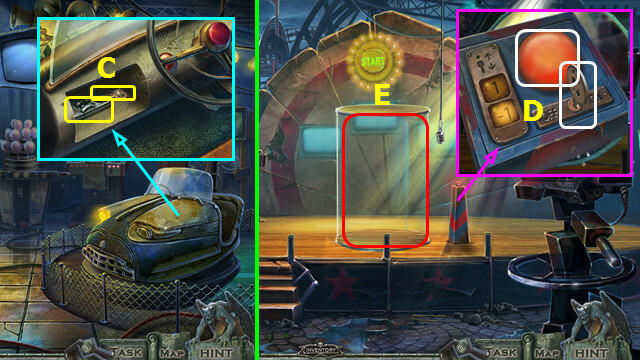 Place the 3 TROPHIES; select the device (P). Drag the blue carts from (A) to (B). 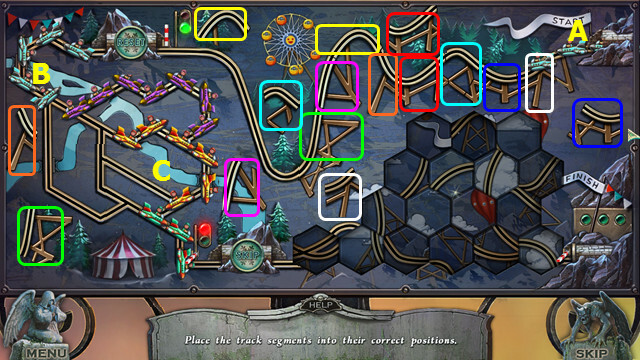 Move the purple, yellow, and green carts to the shown positions (C). Drag the green carts from (D) to (E). Drag the blue carts from (F) to (D). Drag the blue cars from (D) to (H). Talk to the Ticket Taker; take the SWITCH (K). 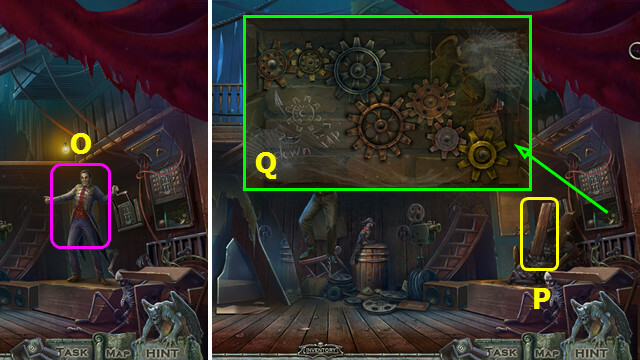 Place and select the SWITCH (L). Move the knots as shown (M) and (N). 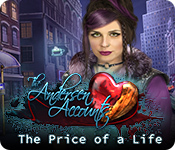 Talk to Kirsten; give the BLANKET and take the 1/2 AUTOMOBILE EMBLEM HALF (O). Talk to the Ticket Taker and take the PAGER (P). Take the 1/3 FUSE SWITCH (A). Take the 2/2 AUTOMOBILE EMBLEM HALF (B). Place the 2 AUTOMOBILE EMBLEM HALVES; take the 2/3 FUSE SWITCH and LIFT KEY (C). 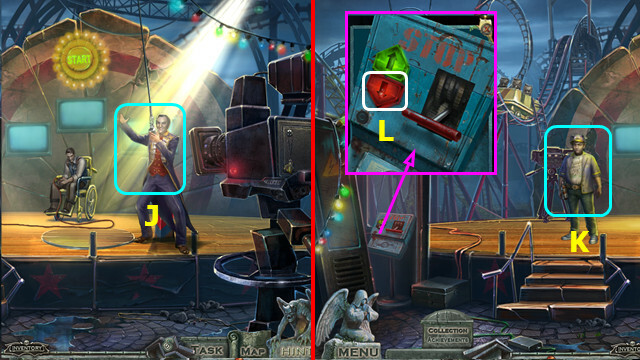 Place and select the LIFT KEY; press the red button (D). Use the SCREWDRIVER on the 4 screws and remove the cover; take the 3/3 FUSE SWITCH and BELT (G). 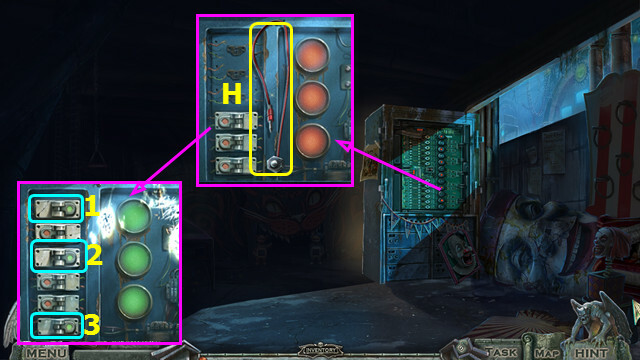 Take the 1/2 CONNECTOR; place the 3 FUSE SWITCHES (H). Play the HOP; earn the HYDRAULIC ARM (J). Take the SHIP WHEEL (K). Take the ANCHOR EMBLEM (L); place the HYDRAULIC ARM (M). Combine the TOY SHIP, SHIP WHEEL, and ANCHOR EMBLEM; take the MOTOR. Place the MOTOR and BELT; select (N). 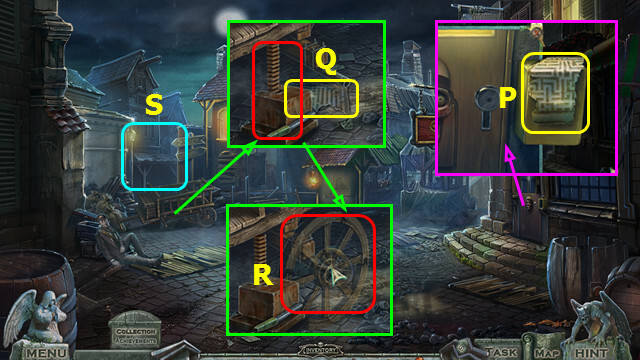 Move the items; place the gears as shown (Q). Take the WRENCH EMBLEM (R). Use the SCREWDRIVER to remove the 4 screws; take the 1/2 NUMERICAL CYLINDER (S). Place and select the WRENCH EMBLEM; take the CRACKERS and METAL BALLS (A). Place the CRACKERS: take the 2 RECORDER BUTTONS (B). Place the 2 RECORDER BUTTONS; select (1-4). Remove the damaged spring and place the SPRING (F); place the METAL BALLS (E). Drag the button to (G) 5x. Drag the button to (H). Drag the button to (I) 5x. 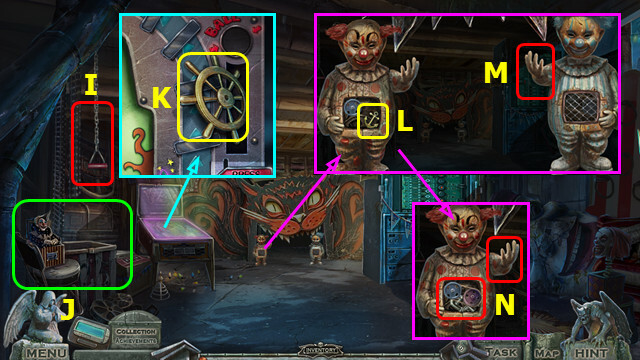 Take the CLOWN KEY (J). 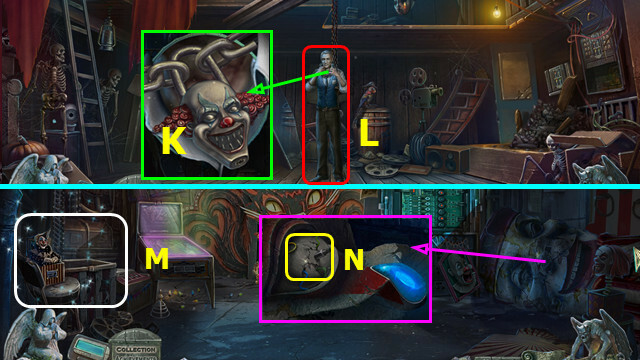 Place and select the CLOWN KEY (K). Talk to Felix; take the CLOWN TEAR (L). 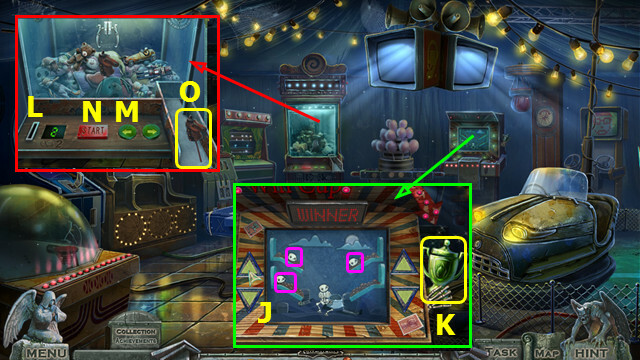 Play the HOP; earn the LIGHTBULB (M). Place the CLOWN TEAR; take the 2/2 CONNECTOR (N). Place the 2 CONNECTORS and LIGHTBULB (O). Arrange the wires as shown (P). 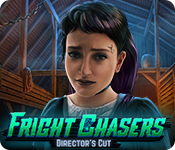 Talk to Felix; take the 1/3 COFFIN KEY (D). Take the SKULL CHARM (E). Talk to Astrid; take the STONE FLOWER (F). 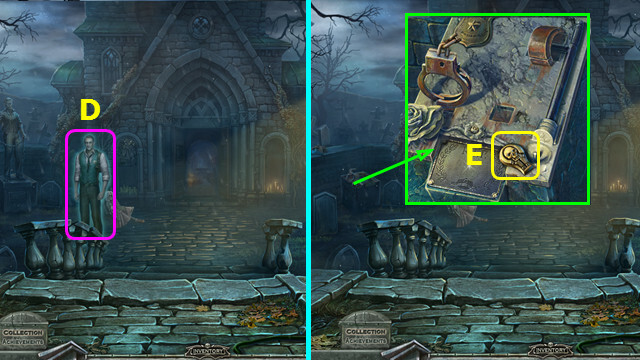 Place the SKULL CHARM; take the HANDCUFF and SWORD CLUE (G). Place the HANDCUFF (H) and STONE FLOWER (I). Take the 2/2 NUMERICAL CYLINDER (L). Take the 1/2 GLISTENING JEWEL (M). 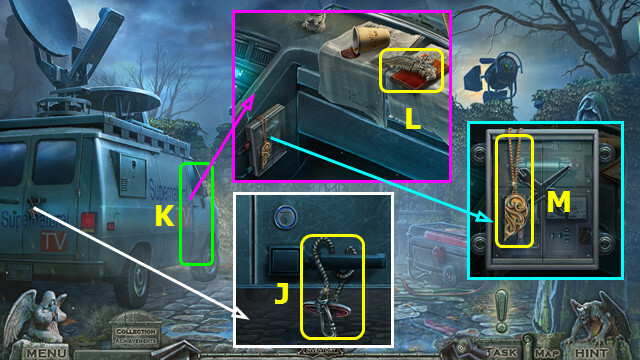 Take the 2/3 COFFIN KEY (N). Take the 1/2 OWL FIGURINE and GARDEN SPADE (O). Use the GARDEN SPADE (P). Place the 2 NUMERICAL CYLINDERS; enter 1-8-8-3 (Q). 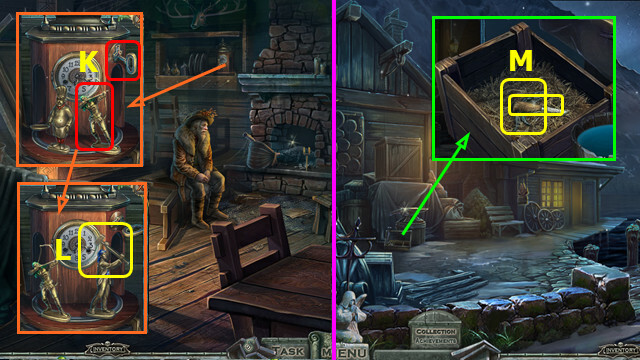 Open the crate; take the 3/3 COFFIN KEY and GLUE (R). 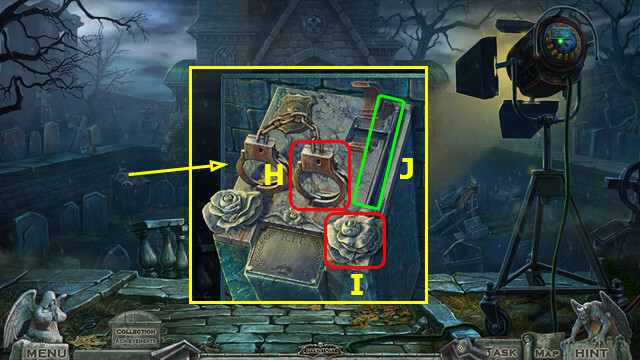 Place and select the 3 COFFIN KEYS (A). Take the FISH EMBLEM and DRAINED SOUL SWORD (B). 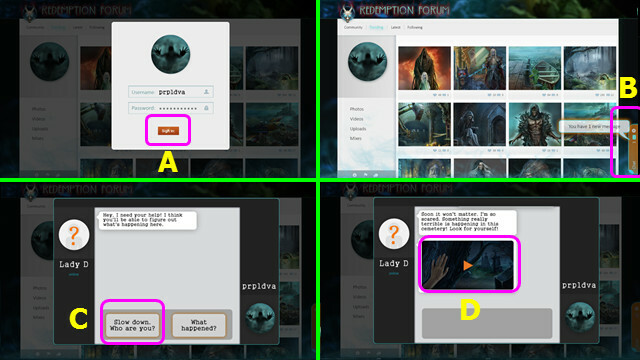 Place the FISH EMBLEM (C). 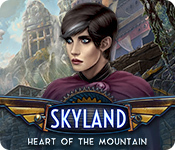 Play the HOP; earn the 2/2 GLISTENING JEWEL (D). 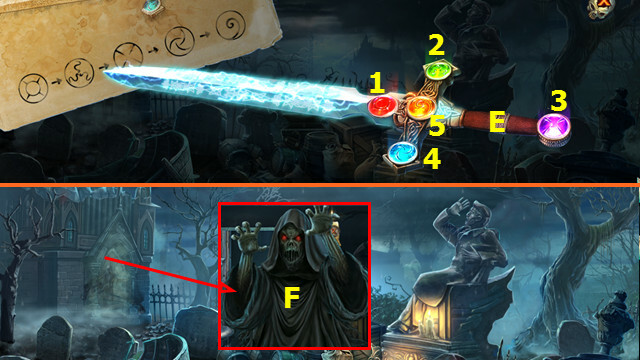 Combine the DRAINED SOUL SWORD, SWORD CLUE, and 2 GLISTENING JEWELS. 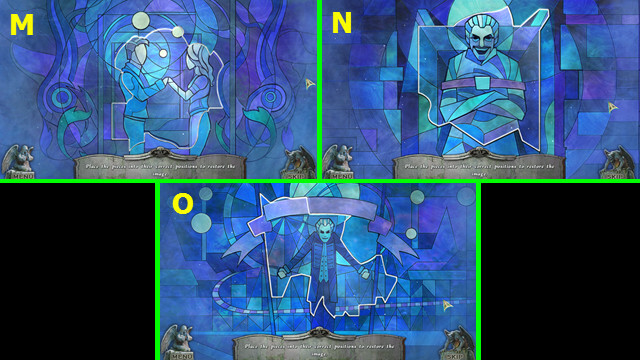 Select (1-5); take the CHARGED SOUL SWORD (E). Use the CHARGED SOUL SWORD (F). 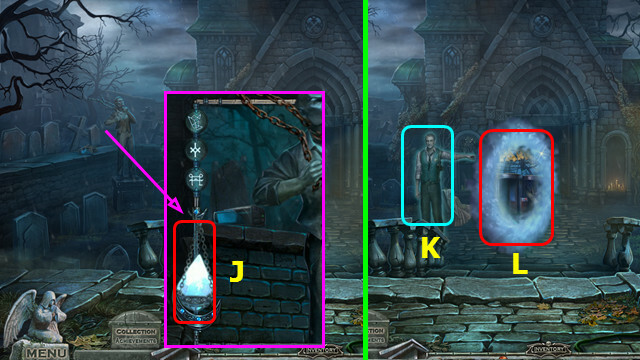 Take the SOUL CRYSTAL (X). 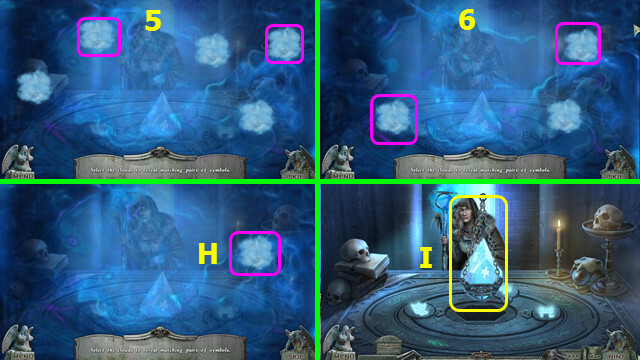 Place the SOUL CRYSTAL; take the GLOWING ARTIFACT (A). 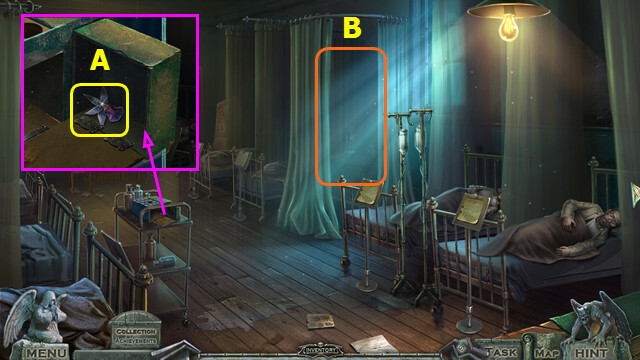 Place the GLOWING ARTIFACT (B). Talk to Karl; take the MEDICAL KIT (C). Take the PROTECTIVE MASK (J). 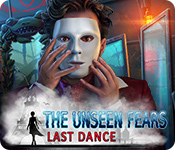 Use the PROTECTIVE MASK on the scene. Talk to the Courier; take the PARCEL (L). 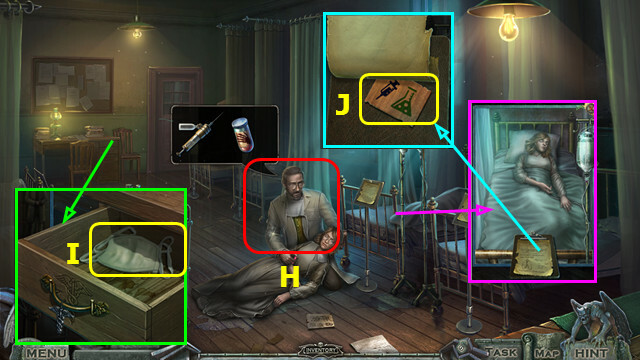 Take the LETTER from the PARCEL; open the PARCEL and take the VIRUS SAMPLES. Take the 5 WHEEL PARTS (green). Take the JACK and place the 5 WHEEL PARTS (M). Assemble the wheel and use the GLUE; take the WHEEL (N). Take the MAP SCRAP (O). Take the 1/2 MAP PART (P). 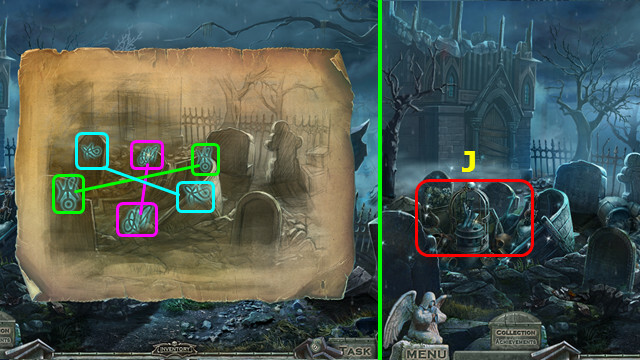 Place and select the JACK 2x; take the 2/2 MAP PART (Q). Combine the MAP SCRAP, 2 MAP PARTS, and GLUE to make the CITY MAP. 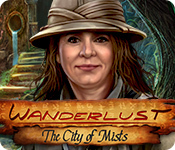 Use the CITY MAP and walk left (S). Move from (A) to (B) to earn the boards. Move from (C) to (D) to earn the apple. Move from (E) to (F) to move the horse. Move from (G) to (H) to earn the extinguisher. Move from (I) to (J). to put out the fire. Move from (K) to (L) to earn the cane. Move from (M) to (N) to pull the boat in; continue to (O) to earn the key. 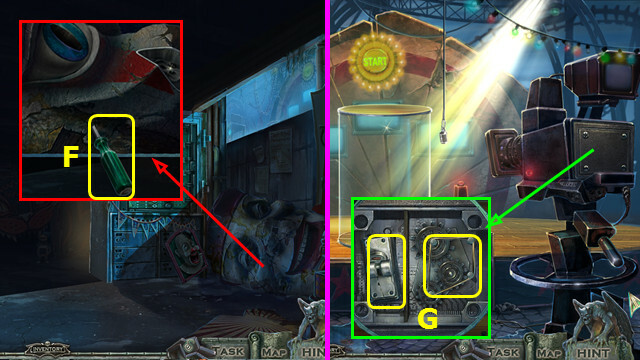 Move from (P) to (Q) to unlock and enter the hospital. Take the 1/4 BONE (R). Take the 1/2 BIRD EMBLEM (S). Take the 2/2 BIRD EMBLEM (T). 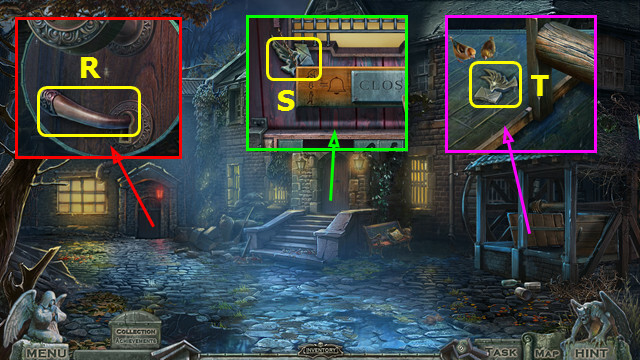 Take the 2/2 OWL FIGURINE; place the 2 BIRD EMBLEMS (U). Open the bag and take the PLATED LETTER (V). Place the PLATED LETTER; take the ENVELOPE (W). Open the ENVELOPE, read the letter, and take the 2 HOSPITAL BUTTONS. 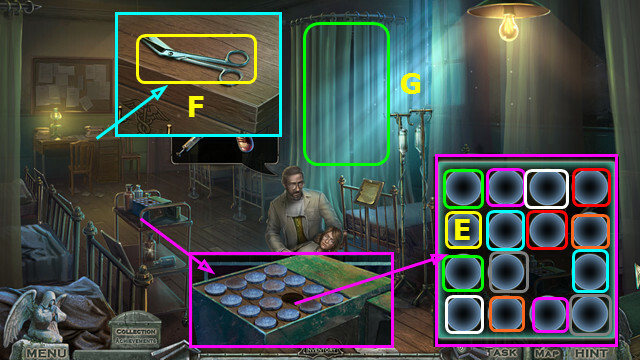 Place the 2 HOSPITAL BUTTONS; arrange as shown (A). Talk to Karl again (D). Select pairs (color coded); take the MEDICINE (E). Select and play the HOP; earn the SYRINGE (G). Give the SYRINGE and MEDICINE; take the DRAWER HANDLE (H). Place and select the DRAWER HANDLE; take the PROTECTIVE MASK (I). Move the paper; take the 1/2 MEDICAL CARD (J). Talk to Karl and give the VIRUS SAMPLES; take the LENS INSTRUCTIONS (K). Take the 2/4 BONE (L). Use the SCISSORS and take the EMPTY BUCKET (N). Take the WOODEN LUNGS (O). 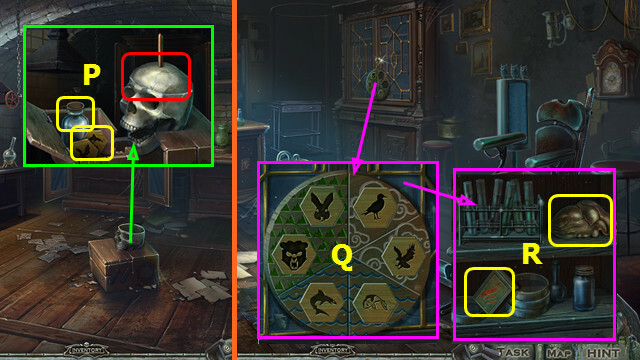 Place the 2 OWL FIGURINES (P). 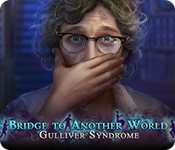 Place the WOODEN LUNGS; take the STETHOSCOPE (A). Place the EMPTY BUCKET and select it 2x; take the BUCKET WITH WATER (B). Use the BUCKET WITH WATER; earn the WOODEN EYE (C). 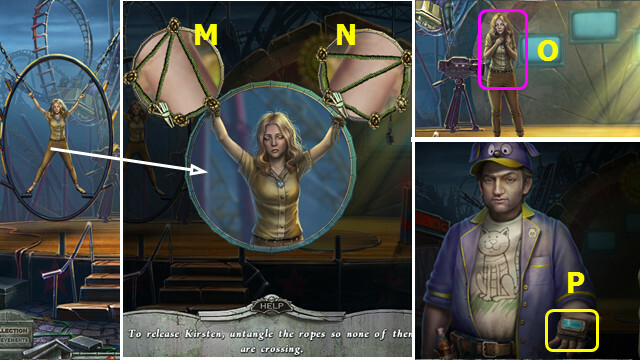 Place the REFLECTOR, STETHOSCOPE, and WOODEN EYE (D). 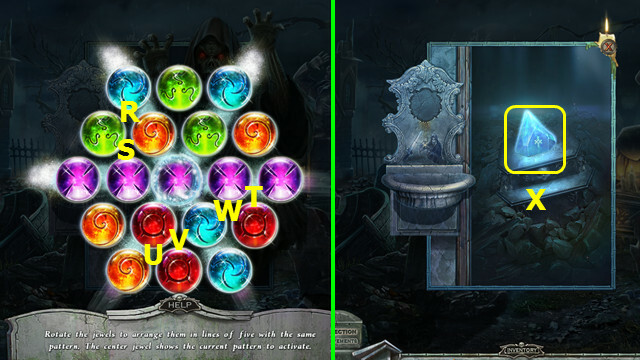 Take the 1/2 FLOWER EMBLEM (E). 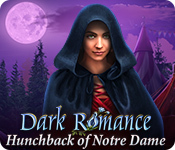 Take the 2/2 FLOWER EMBLEM (F). Take the 3/4 BONE (G). 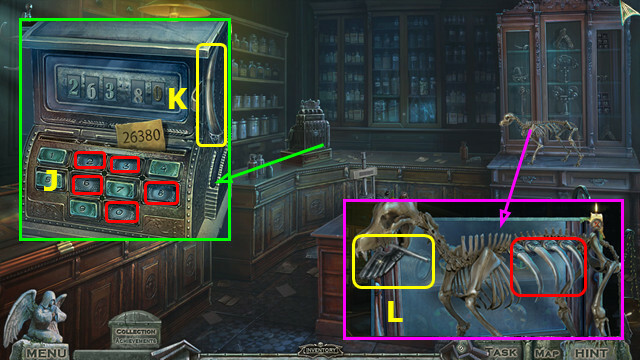 Place the 2 FLOWER EMBLEMS; take the CASH REGISTER BUTTON (I). 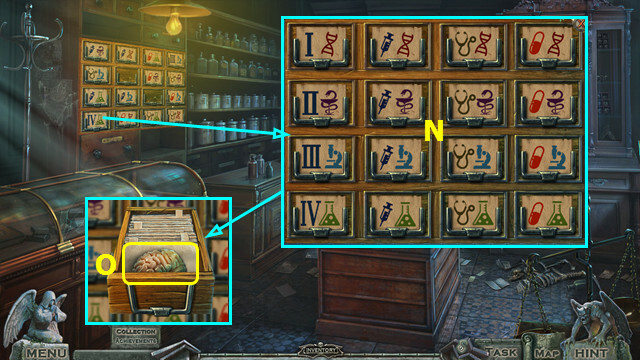 Place the CASH REGISTER BUTTON; select 2-6-3-8-0 (J). Take the 4/4 BONE (K). Place the 4 BONES; take the 1/2 CADUCEUS HALF (L). Open the glass and place the LENS INSTRUCTIONS (M). Open and place the lenses as shown; take the MODIFIED LENS (O). Walk down, left, and forward 2x. 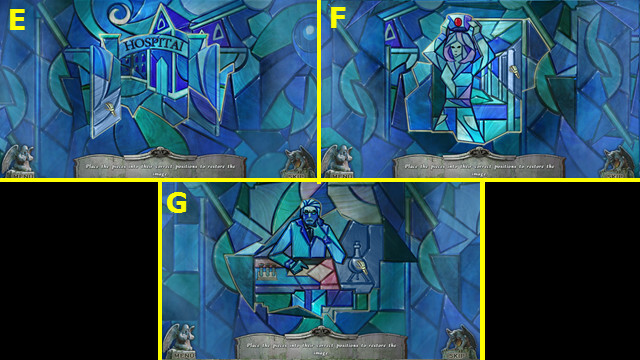 Place and select the MODIFIED LENS (A). Connect the bacteria as shown (B). Connect the bacteria as shown (C). 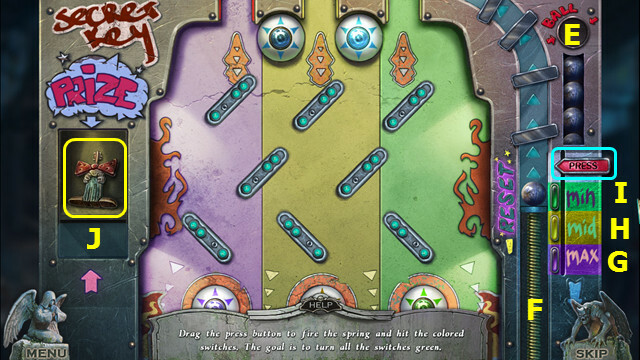 Connect the bacteria as shown (D). Take the BACTERIA SAMPLE (E). Take the MEDICAL BOOK and LABORATORY KEY (H). 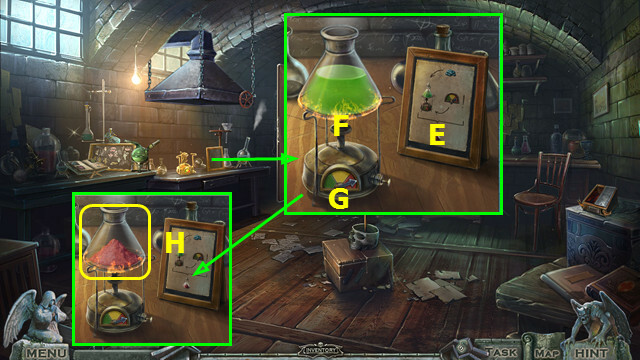 Place and select the LABORATORY KEY (I). 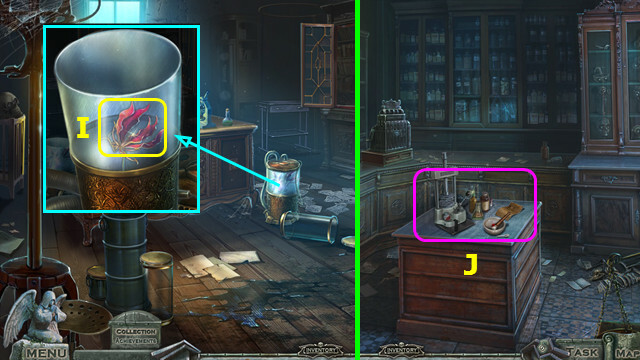 Place the MEDICAL BOOK and BACTERIA SAMPLE (J). 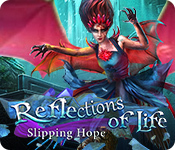 Play the HOP; earn the PINK CRYSTAL RECIPE (K). 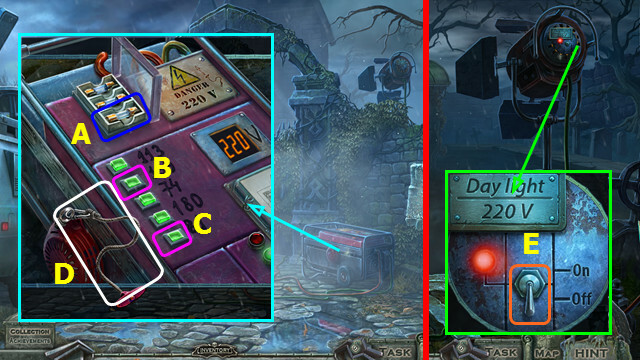 Place and select the VALVE; earn the 2/2 MEDICAL CARD (L). Take the GREEN LIQUID (M). Walk down 2x, and go right. 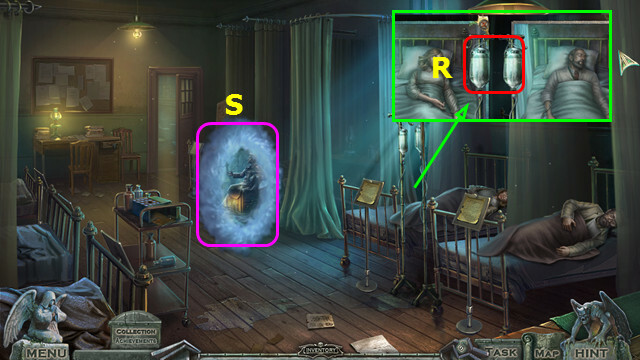 Place the 2 MEDICAL CARDS in the frames. 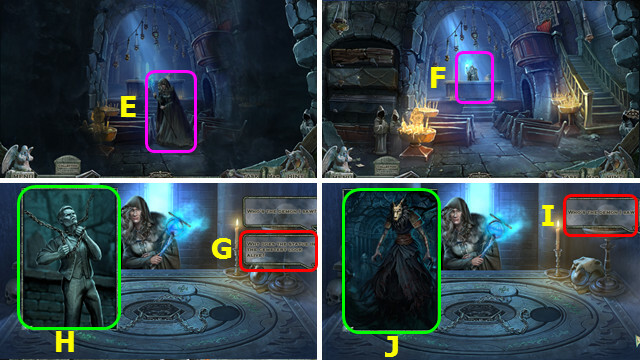 Arrange the cards as shown (N). Take the BRAIN HALF (O). Walk down and go left 2x. 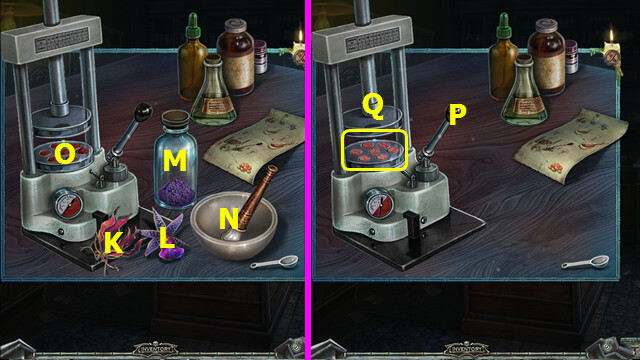 Remove the cap and place the BRAIN HALF; take the ANIMAL TILES and PURPLE POWDER (P). Walk down and go forward 2x. 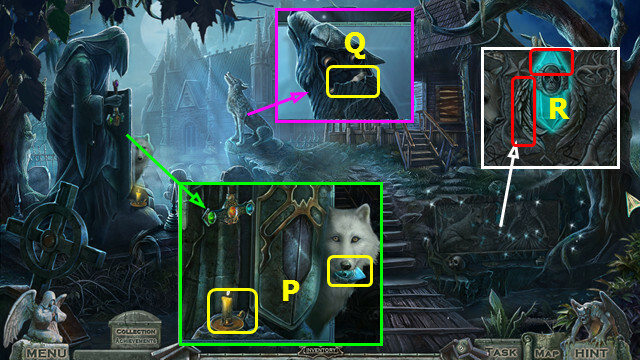 Place the ANIMAL TILES and arrange as shown (Q). Open the cupboard; take the WOODEN HEART and MATCHES (R). Place the WOODEN HEART; take the 1/2 FLOWERS (A). 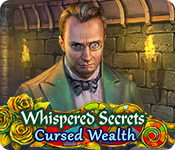 Play the HOP; earn the BLUE PILLS (B). Use the MATCHES; take the JAR OPENER and BRONZE LEAF (C). 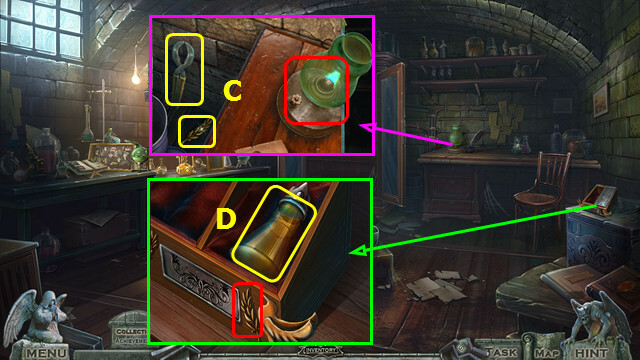 Place the BRONZE LEAF; take the ORANGE LIQUID (D). 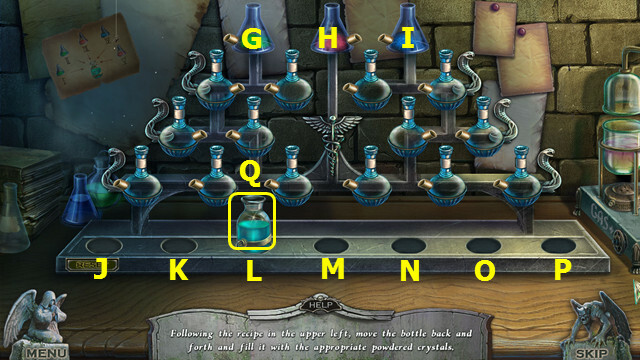 Place the PINK CRYSTAL RECIPE (E). Use the MATCHES; and place the GREEN LIQUID (F). Add the BLUE PILLS; take the PINK CRYSTALS (H). Use the JAR OPENER; take the 2/2 FLOWERS (I). Walk down 3x; walk right. Place the 2 FLOWERS (K-L), and PURPLE POWDER (M). Select P; take the RED PILLS (Q). 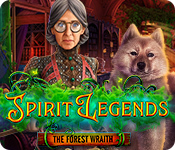 Play the HOP; earn the GREEN CRYSTAL RECIPE (A). 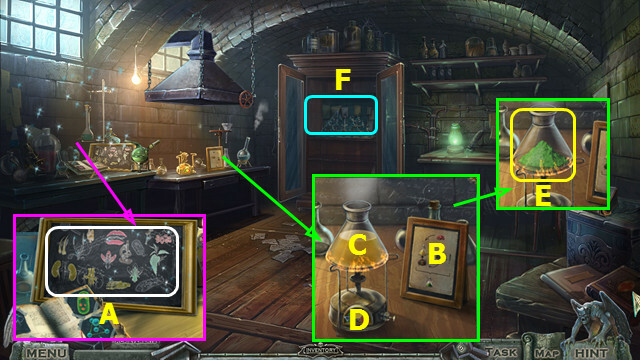 Place the GREEN CRYSTAL RECIPE (B). Place the ORANGE LIQUID (C). Add the RED PILLS; take the GREEN CRYSTALS (E). Place the PINK CRYSTALS (H). Place the GREEN CRYSTALS (G). 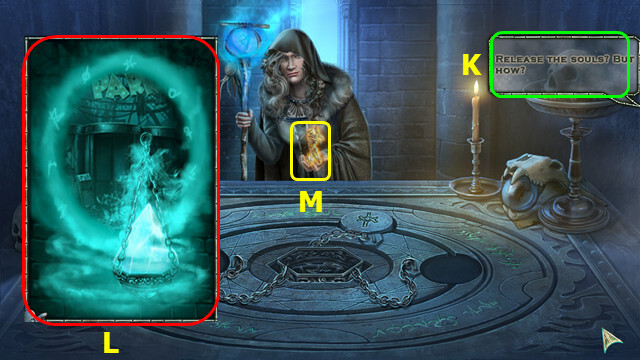 Move L-K, select Gx2, move K-M, select G.
Talk to Karl; take the 1/2 ANGELIC AMULET (A). Take the BONE HANDLE (B). Take the 1/2 LUNAR TILE (I). Take the LION’S HEAD and place the BONE HANDLE (J). Place the LION’S HEAD; take the SEAM RIPPER and 2/2 LUNAR TILE (K). 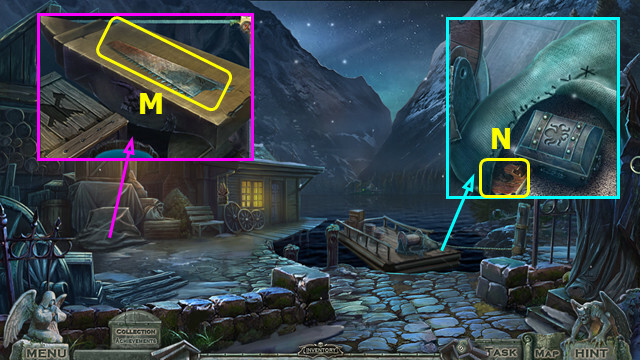 Place the 2 LUNAR TILES; arrange as shown (L). 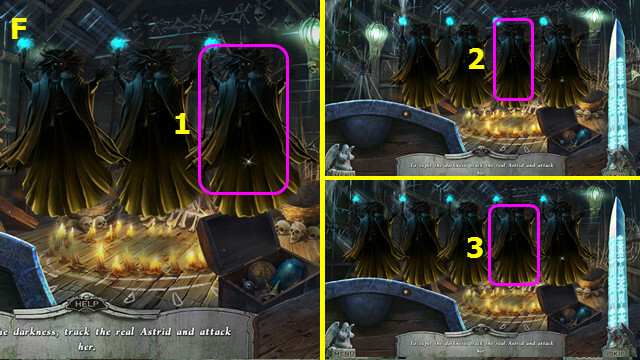 Talk to Astrid; take the 1/3 ORNATE RING (M). Take the 2/2 CADUCEUS HALF (N). 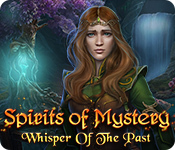 Take the 2/2 ANGELIC AMULET (O). Take the CLOCK KEY (P). 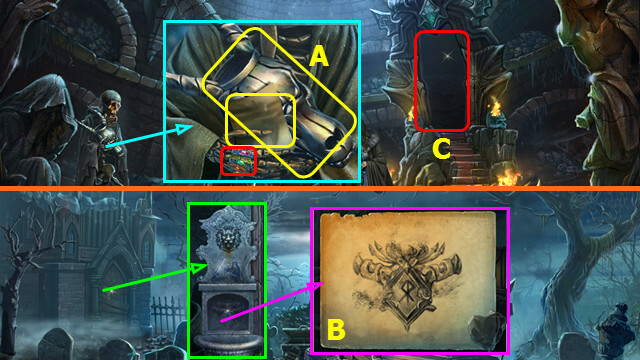 Place the 2 ANGELIC AMULETS; take the COAL and 2/3 ORNATE RING (Q). 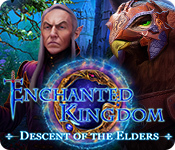 Play the HOP; earn the 3/3 ORNATE RING (R). 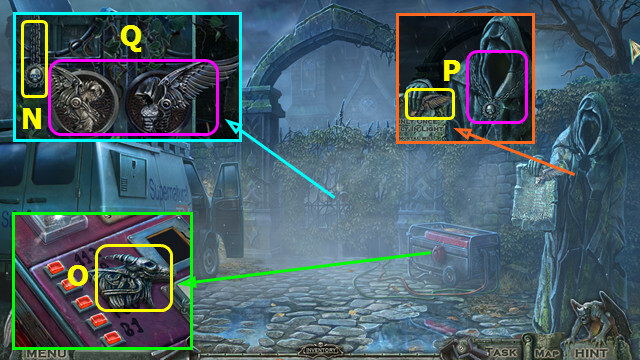 Place the 2 CADUCEUS HALVES; take the PORTAL FRAME and 1/3 BRONZE CHARM (S). 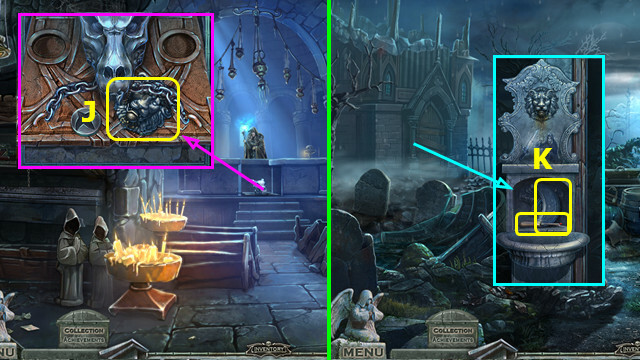 Place the 3 ORNATE RINGS; take the PAPER and KYRKOGRIMM SKULL (A). Walk down 2x, and go left. 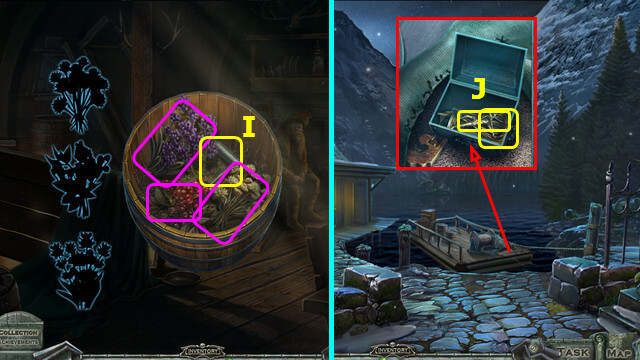 Use the PAPER and COAL; take the PORTAL CLUE (B). 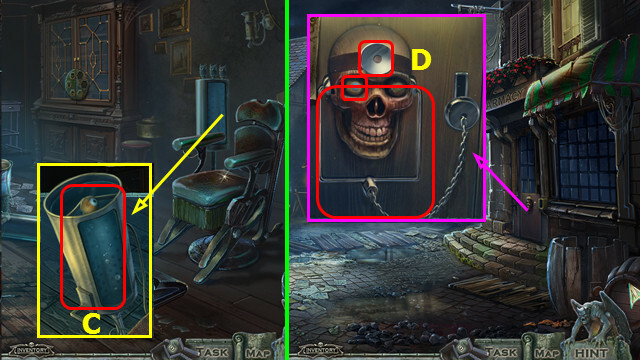 Place the PORTAL FRAME (D) and KYRKOGRIMM SKULL (E). 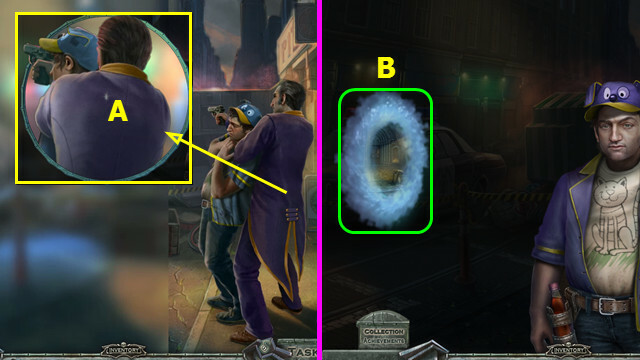 Place the PORTAL CLUE (F). 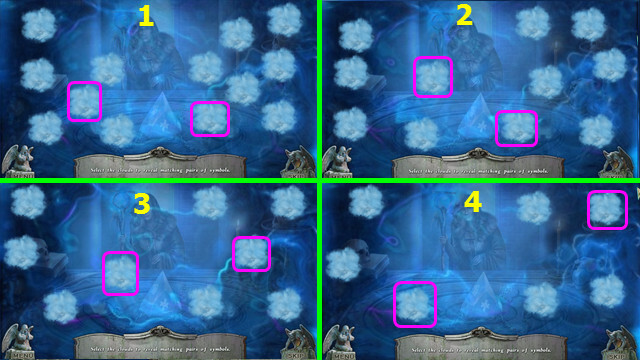 Drag the 4 runes from (G) to (1-4). 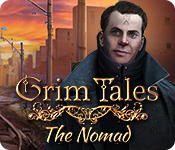 Talk to Astrid; take the 1/3 KYRKOGRIMM RUNE (H). Remove the cover; take the SAW BLADE (M). Use the SEAM RIPPER; take the SAW HANDLE (N). Take the BLADE HOLDER (O). Combine the SAW BLADE, SAW HANDLE, and BLADE HOLDER to make the SAW. Take the STICKS and use the SAW (P). 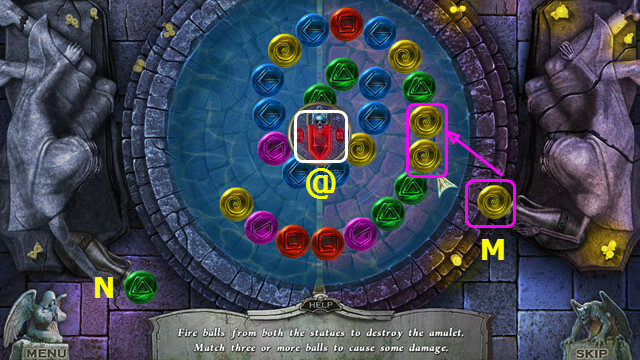 Click 1-13 when the ball is near to move through the maze. Do this 2 more times as you go through the dialog. 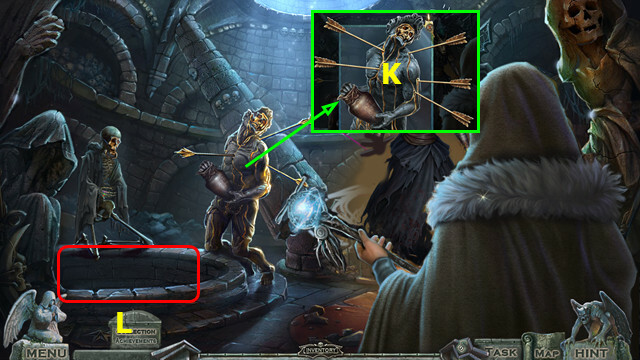 Talk to the Old Man; take the ARROW RECIPE (F). 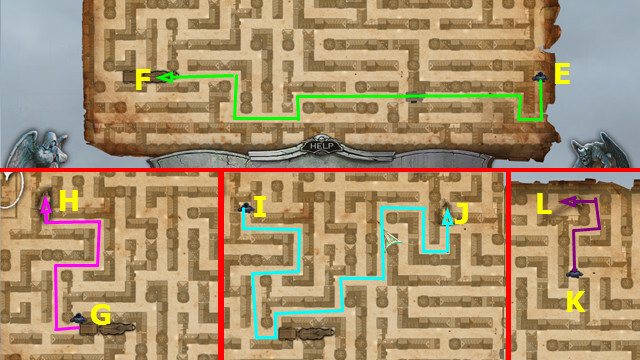 Take the OCTOPUS EMBLEM and use the CORKSCREW (H). 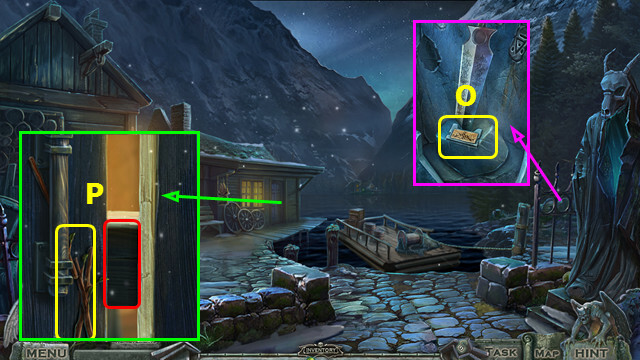 Remove the items and collect the HERBS (pink); take the FERRY HANDLE (I). 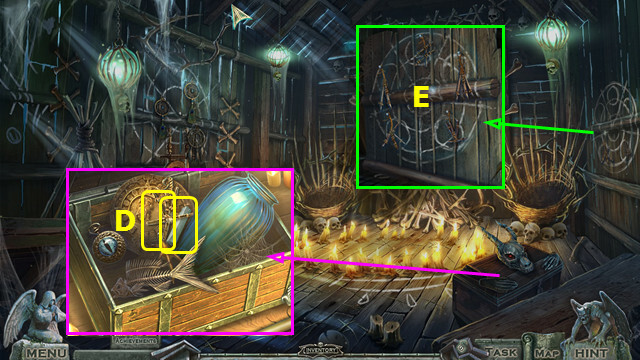 Place the OCTOPUS EMBLEM; take the HUNTER FIGURINE and ROPE (J). 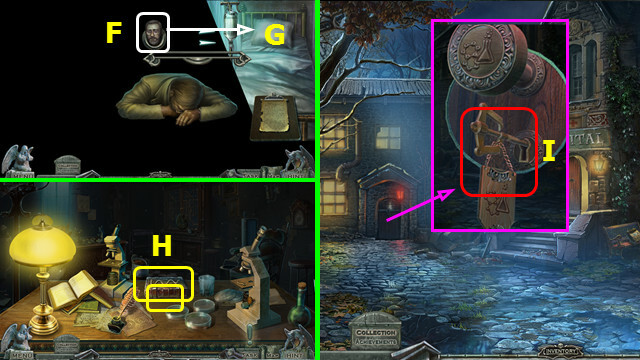 Place the HUNTER FIGURINE; place and select the CLOCK KEY (K). Take the HAMMER EMBLEM (L). 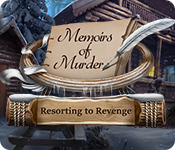 Place the HAMMER EMBLEM; take the WHITTLING KNIFE and STONE WING (M). Combine the ARROW RECIPE, STICKS, HERBS, ROPE, and WHITTLING KNIFE to make the ARROWS. 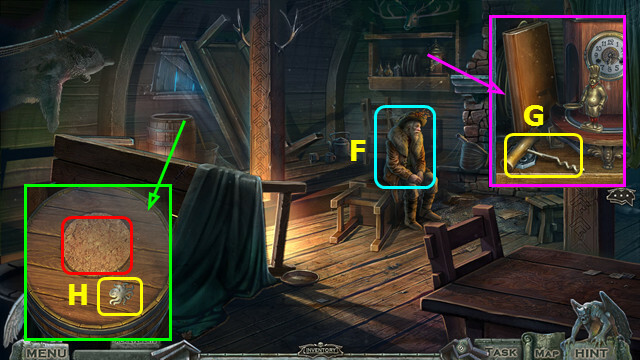 Give the ARROWS and talk to the Old Man; take the FERRY KEY (N). Use the FERRY KEY and place the FERRY HANDLE (O). 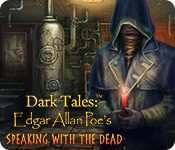 Take the STONE FRAGMENT and LIT CANDLE (P). Take the ANTIQUE FORK (Q). Place the STONE FRAGMENT and STONE WING (R). 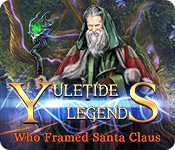 Play the HOP; earn the ANCIENT SCROLL. 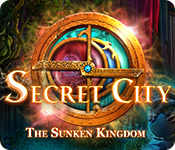 Open the ANCIENT SCROLL and read the instructions; take the 2/3 KYRKOGRIMM RUNE. 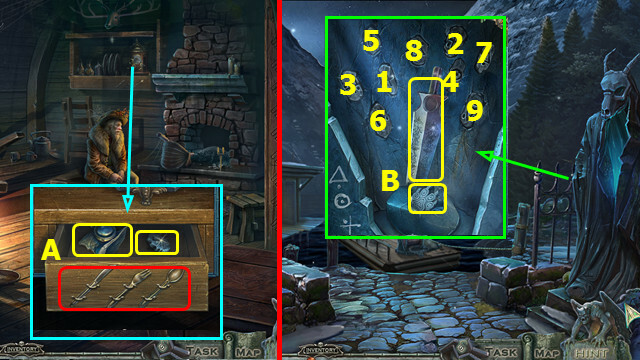 Place the ANTIQUE FORK and swap the utensils as shown; take the DAMAGED WOLF MECHANISM and 3/3 KYRKOGRIMM RUNE (A). 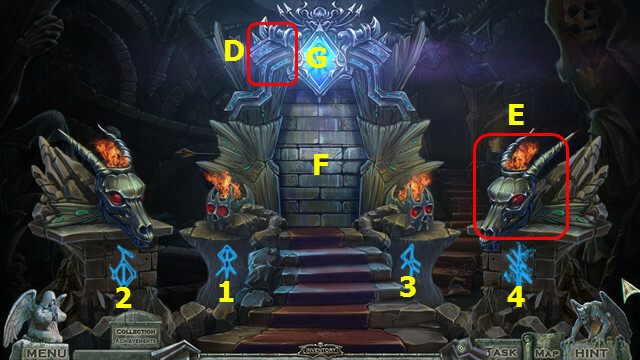 Place the 3 KYRKOGRIMM RUNES and select 1-9; take the SHIELD INSIGNIA and RUSTY BLADE (B). Place the SHIELD INSIGNIA; take the MECHANISM PART and TONGS (C). 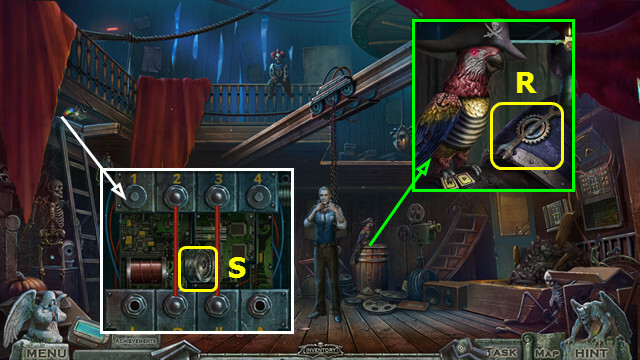 Add the MECHANISM PART to the DAMAGED WOLF MECHANISM to make the WOLF MECHANISM. 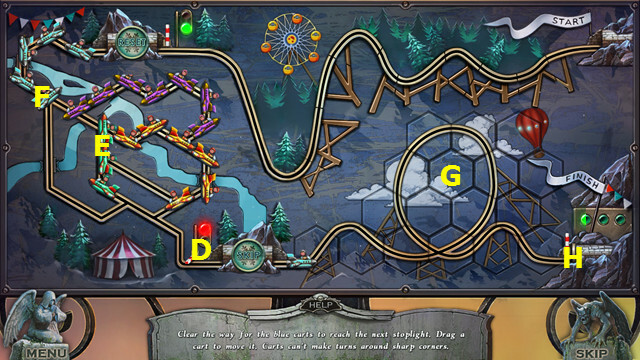 Place and select the WOLF MECHANISM; play the HOP (D). Take the WOLF HAMMER (E). 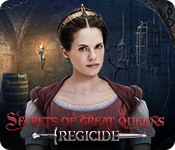 Place the RUSTY BLADE and select the bellows; use the TONGS to take the SCORCHED BLADE (G). 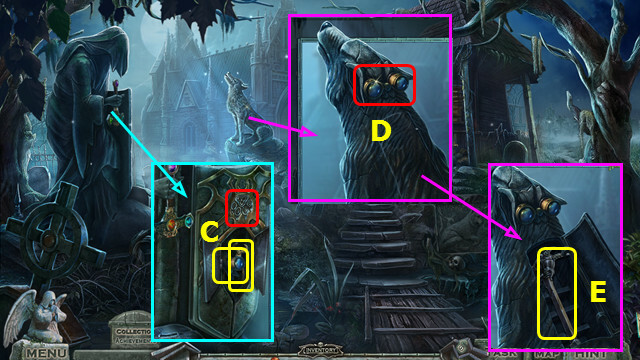 Place the SCORCHED BLADE and WOLF HAMMER; select 3x (H). 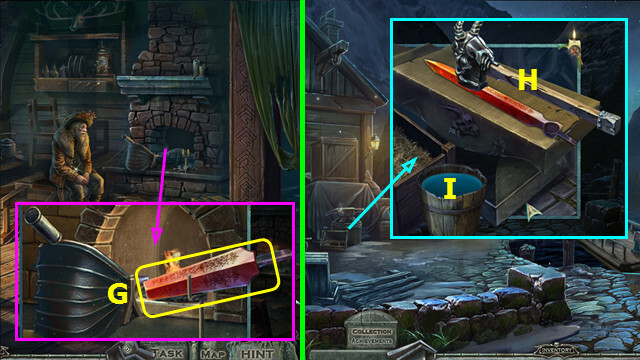 Move the blade to the bucket to make the DRAINED SWORD (I). Place the DRAINED SWORD; take the SWORD OF LIGHT (J). 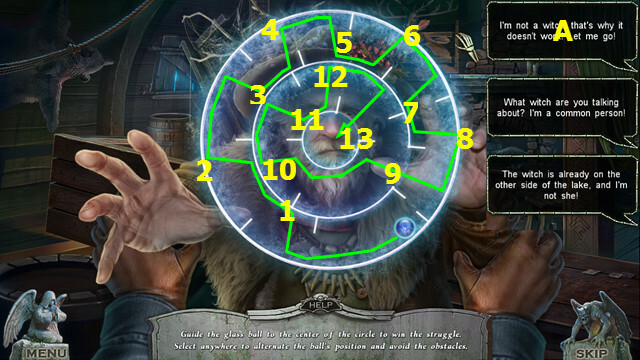 Play the HOP; earn the SHIELD OF LIGHT (K). Use the SHIELD OF LIGHT and go forward (L). 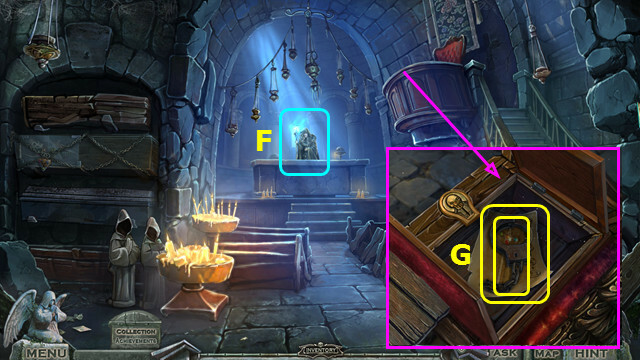 Use the LIT CANDLE on the scene 2x. Read the scroll and take the 2/3 BRONZE CHARM (N). 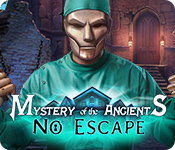 Take the SKELETAL HAND and place the ROPE (A). 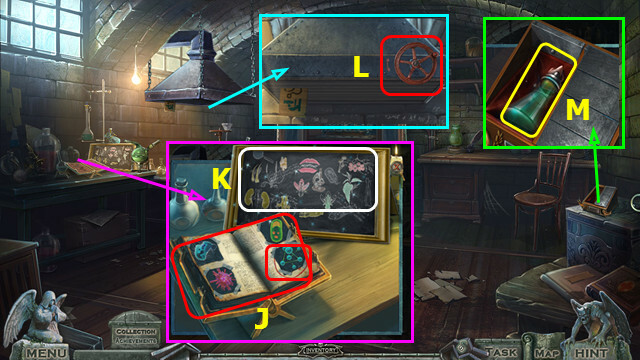 Move all the items to the board; take the DREAMCATCHER (B). 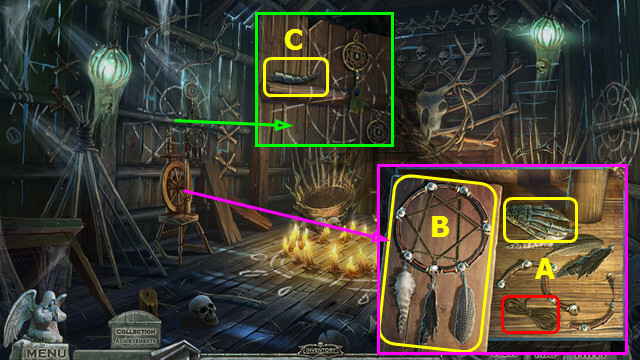 Take the SKELETAL HORN and place the DREAMCATCHER (C). 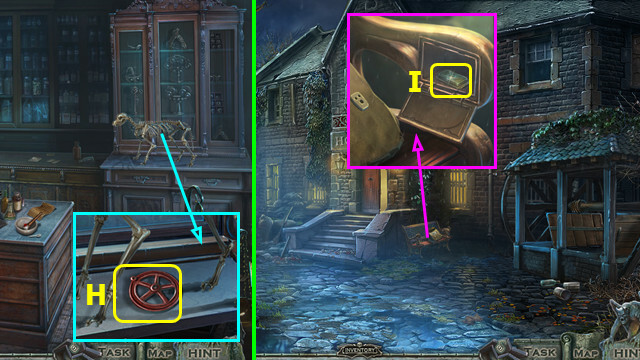 Place the SKELETAL HAND and SKELETAL HORN; take the 3/3 BRONZE CHARM and CHALK (D). Use the CHALK and 3/3 BRONZE CHARM (E). 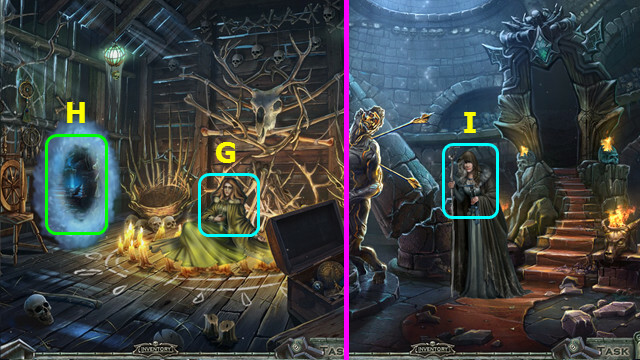 Select the real Astrid 1-3 (F). 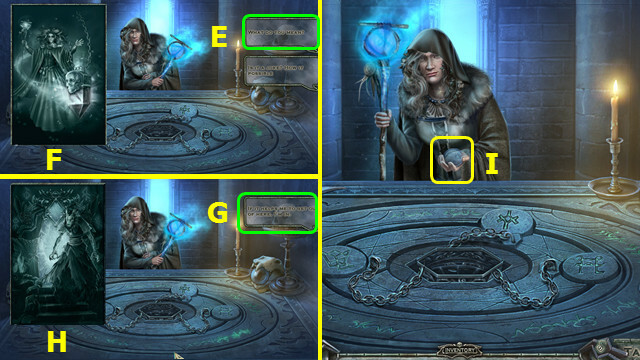 Talk to Astrid; take the DARK AMULET (G). Talk to Astrid; take the CEMETERY SKETCH (I). 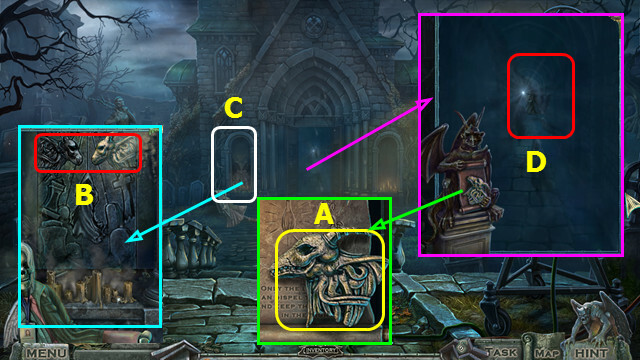 Use the CEMETERY SKETCH on the scene; connect the pairs (color-coded). 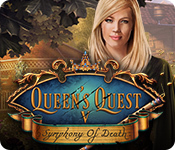 Play the HOP; earn the GOLDEN ARROWS (J). Use the GOLDEN ARROWS (K). 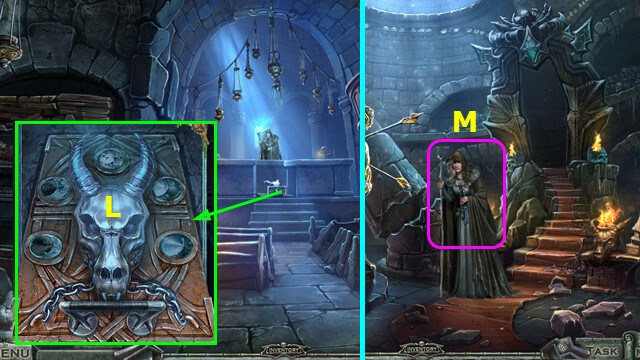 Place the DARK AMULET (@). Shoot the balls to make sets of 3 or more (M). You can shoot from both sides (N). Continue shooting to destroy the chain. Congratulations! 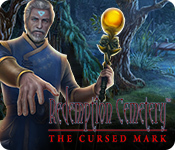 You have completed Redemption Cemetery: Embodiment of Evil!